Our interactive displays feature easy-to-use tools such as EasiNote for on-screen writing and slideshows. If you prefer to keep using familiar programs such as PowerPoint, you can do that too—the panels work well with multiple systems, and you’re free to choose what works best for you. Clear Touch Interactive panels come fully equipped with our premier suite of educational software. Easy to learn and use, our software only requires a single training session to teach to your staff. And with no commitments and no subscriptions, our software is an affordable option. Use EasiNote to draw diagrams and present slideshows, Snowflake to create animations and EasiCapture to save and edit videos and screenshots. EasiConnect lets you connect wirelessly to tablets and other devices. For administrators, EasiRemote keeps all displays on the same system for simple troubleshooting and effortless group communication. EasiNote gives you the ability to draw, annotate, and write on top of your presentations. Whether you need a simple whiteboard or want to annotate an existing lesson on the fly—EasiNote delivers all of the beautiful simplicity of an interactive panel or interactive whiteboard. EasiConnect allows you to seamlessly connect mobile devices and tablets to your interactive display. EasiConnect also lets you manage your EasiNote and PowerPoint presentations from your phone or tablet. Need to record your teaching or presentations? EasiCapture allows you to easily capture and share recordings of your lesson and voice on the interactive panel. Manage your interactive displays with ease. EasiRemote keeps all interactive panels on the same system for simple remote troubleshooting and effortless school or district communication. Snowflake is our intuitive software for creating animations for your lessons. And it’s as simple as 1, 2, 3. Snowflake comes prepackaged on every onboard PC, along with the rest of our educational suite of software. 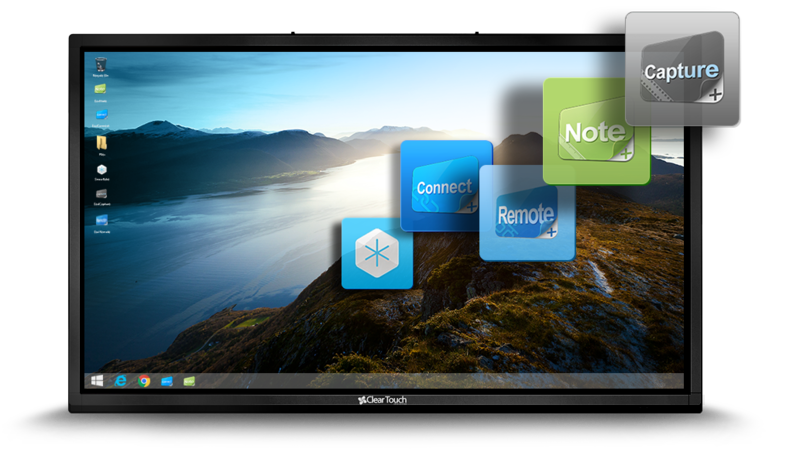 DisplayNote allows your students, both onsite or offsite, to display their screens onto the Clear Touch display. Now the classroom iPads, Chrome Books, or laptops can be easily displayed on screen for classroom viewing. Call us Toll Free 1-888-775-0651 Perfect display for interactivity!